The Infant Leaped in Her Womb! 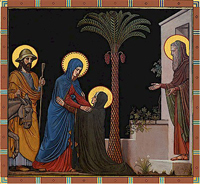 Happy feast of the Visitation! This account of the Blessed Virgin visiting her cousin Elizabeth is is one of my favorites in scripture. I love it because the life of the unborn child is so clearly and beautifully illustrated.